This article talks about an online tool to create professional flowcharts online and get the embed code. A flowchart is a diagram that shows the various steps of a process and connection between them in chronological order. Flowcharts are used to graphically represent a process or workflow of a process. Visme is an online service to help you create the visualization of data. You can create professional flowcharts with Visme easily in a matter of minutes. It offers stylish themes, connections, shapes, graphics, etc. which you can use with a simple drag and drop. You can also add images and videos to the flowchart. With all these easy-to-use features, you can make professional flowcharts for free with some limitations. So, let’s get started. How to Create Professional Flowchart Online with Vismo? With Visme, you can easily create professional flowcharts in minutes. The process is very simple and straightforward. In order to use this service, you have to create an account first. Once that’s done, you are ready to go. Visme offers a couple of free professional flowchart themes; you can choose any of them to edit or start with a blank canvas to make the flowchart from scratch. Shape: This option offers text and flowchart designs which you can add to your chart and personalize. 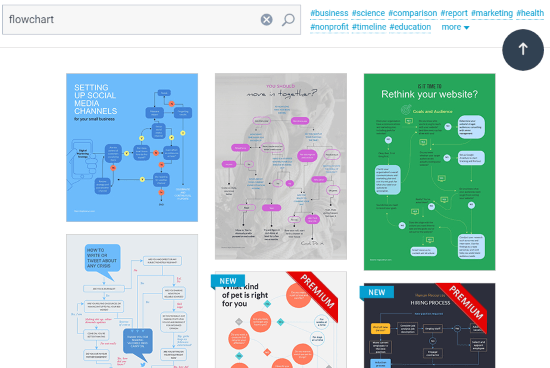 Graphics: Graphics has a collection of shapes including social media, data, arrow, animal, business, etc. Data: The Data option has various types data representation diagrams. Each diagram has a set of all the shapes for that diagram. 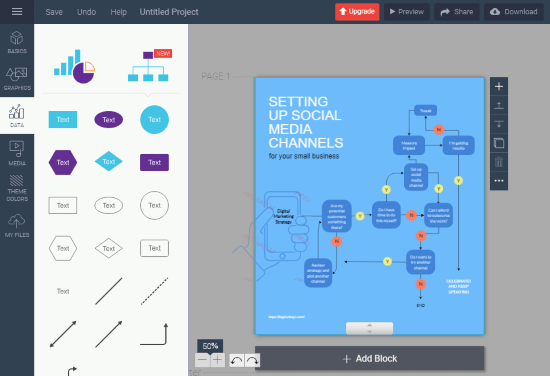 Media: From the Media option, you can add video, audio, and GIF to your flowchart. You also get options to set the start/end timing, repeat, and loop. Background: With this option, you can choose a solid color background for your flowchart. Upload: This option allows you to upload your media to Visme. 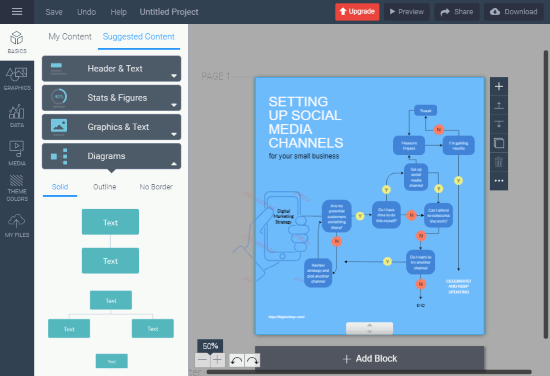 You can use that media in your flowchart and can also set images as chart background. With all these options, you can easily make the desired type of professional-looking flowcharts. To get the embed code for the flowchart, you have to publish it on the web. You can do that with the Share option present at the top right corner. Simply add a title and short description for the flowchart and click the “Publish to the Web” button. This gives you a shareable link to your flowchart. Along with publishing to the web, you can also save your flowchart to the Visme public gallery. 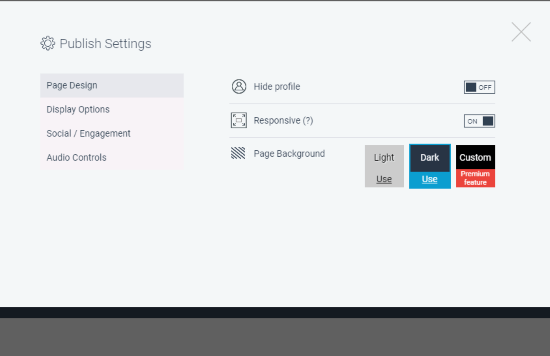 Page Design: Hide your profile, make the chart interactive, and select a page background color. Display Options: Set the media to autoplay, enable looping, and enable/disable media controls. Social/Engagement: Allow social share and comments (these options comes under premium features). Audio Controls: Enable/disable background music and set the play time, fading effect, and looping. Once you publish your flowchart to the web, you can get the HTML embed code from the Share option. You can use that code to embed your flowchart on web pages. Give this online professional flowchart maker a try here. Visme is a simple yet powerful tool to create professional flowchart online. With all it’s easy-to-use features, anyone can create professional flowcharts online with Visme, even beginners.